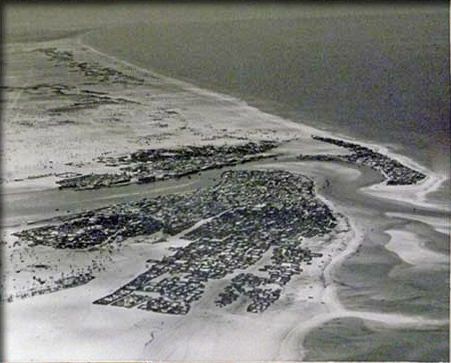 The picture above, of a large village on an otherwise barren sand-spit, is Dubai as it was roughly when I was born, in the early 1950s. As you can see, there is not much there. 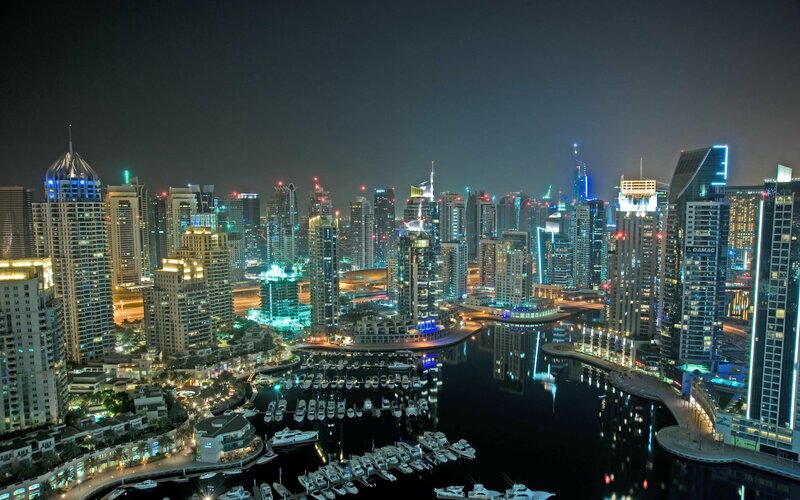 At that point, the United Arab Emirates, of which Dubai and Abu Dhabi are the main economic engines, did not yet exist. The emirates of the region were British protectorates. Prior to 1950, Dubai had benefited from its inlet to become the main re-export hub in the Persian Gulf, while Abu Dhabi had just started exploring for oil. Both had been weakened by the Great Depression and the collapse of their local pearl industry (after the Japanese began large-scale production of cultivated pearls). In the late 1960s, both Dubai and Abu Dhabi began to produce oil, and after the departure of the British in 1971, the emirates developed a federation which became the UAE. Dubai is home to the world’s tallest building, the Burj Khalifa, and both Abu Dhabi and Dubai are chock-a-block with modernist glass towers in a bewildering variety of shapes, colors and designs. And of course, shopping. The UAE is home to many of the world’s grandest malls, including the Emirates Mall with its glass-enclosed four-story ski slope; the Dubai Mall with its Bellagio-style fountains and every shop known from home, from Potbelly Sandwiches and IHOP to ultra-chic designer boutiques; and the brand new World Trade Center mall, which is beautifully done in dark wood latticework that at least makes you feel like you are visiting the Middle East, as opposed to having been blindfolded and dropped into Las Vegas. I had the opportunity to visit the UAE this past weekend to lecture at the New York University campus in Abu Dhabi. While it is hard to form impressions in just a weekend, one cannot but be jaw-droppingly amazed at how much has been built, and how fast, and in such an odd place. After all, the climate (120 degrees F in summer) is the most absurd that you can imagine for building endless walls of glass-skinned towers. And there are few natural resources (other than oil and gas) to justify building thousands of office and residential towers to create an expat community many times larger than the Emirates’ own native population. So Dubai and Abu Dhabi stand as tributes to the power of imagination and money to reshape reality, no matter how unpromising or unlikely the place. But as a good capitalist, who believes that money should be invested at least in part in things that will continue to produce value, one has to ask — is all this sustainable? And who is it all really for? The UAE economy is built mainly on oil, of course, but is seeking to diversify. Using their cheap energy, they are engaging in such energy-intensive industries as aluminum smelting, using imported bauxite ore. Using their central location midway between Europe and Asia, they are seeking to become the major air hub and marine re-export center for Eurasia. And taking advantage of the political chaos in Lebanon and Iraq, and of their own tax-free and duty-free status and political stability, they are seeking to become the financial capital of the Islamic world. There are also various consultancies and management and advising agencies, most focused on the energy industry and regional commerce, and as is typical in boom towns, a huge construction industry and firms to sell, lease, and resell real-estate. In addition, of course, as befits a modern pleasure-palace, the UAE markets itself as a tourist destination to the world for luxurious hotels, shopping, even golf courses and beaches (though these are usable only a few months of the year because of the intense heat and humidity). They are staging events from Formula 1 to a Rolling Stones concert, not mainly for their own citizens, it seems, as much as to create a magnificent party place to attract the world. Still, the oil will not last forever, and what then? Oil and gas fields have been discovered in the Mediterranean, the Artic, and in East Africa, while fracking is expanding the output of oil and gas in older producers such as the U.S. So there is plenty of oil in the world and more on the way every day. Meanwhile, cars are becoming more efficient, populations are becoming more urban and so more amenable to rapid transit, and global warming is leading to the search for alternatives to fossil fuels. No doubt, as Chinese and Indians and Africans acquire cars, and the world is tied together by huge fleets of jumbo and regional jets (many of which will fly from Abu Dhabi and Dubai), the demand for petroleum fuels will continue. But at some point in the future — maybe in 50 years, maybe in 100 — it is going to be cheaper to use solar generated electricity to power vehicles than gasoline, and at that point the revenues from pumping fluids and gases from wells will fall to nearly zero. At that point, will the glass tower villages on the shores of the gulf have generated enough self-sustaining momentum to carry on? Or if deprived of their steroids from oil revenues, will growth stall and decline? (The cost of air-conditioning alone, if not subsidized or replaced by solar power, will make these offices too expensive to compete with space elsewhere). It is too early to say today. All I can suggest is that you try to visit to see a phenomena of hot-house force-fed economic growth unlike any other on the planet. It is ecologically insane, economically questionable, and at times garishly over-the-top. Yet it commands respect for the audacity of its vision. Ozymandius redux! Yet in another way, one has to give thanks for the UAE. As much of the Islamic world tears itself apart, from Libya and Egypt and Syria to Iraq and Afghanistan, the Emirates demonstrate that the Arab world can be open, and incredibly economically successful. Other places have had immense oil wealth but not achieved nearly so much. Open markets, encouragement to entrepreneurship, and generous investment combined with stability and sound laws and restrained (if non-democratic) government has produced urban centers without equal in the developing world, except perhaps for Shanghai. Of course history and demography help. There are no old sectors of town or decaying buildings, no visible slums, and the cheap and exploited labor from the Philippines, Pakistan, and India that make everything run are kept healthier and better paid than they would be at home and always under threat of deportation if they should cause disorder. So the recent history and demography are as artificial and constructed as the buildings themselves. Of course one has to ask, can this artificial construct be sustained politically? Again, as long as the oil and gas money allow the rulers immense leverage over everyone, most likely yes. The real question is what happens when the non-oil economy becomes larger than the oil economy, or when the oil revenues cease. Will the non-native population simply return home, leaving empty shells? Or will they demand a role in running the new Oz they have created with their labor? It will be an interesting future for the UAE in the generations that lie ahead. It is good to see the disturbing future， but either of the oil or the fuel will not be run out due to the higher cost people can not affordable.